If you are like most dog owners your 4-legged friend is part of the family and as such you might want to make him some treats. The treats at the grocery store are full of preservatives that are great if you want your dog treats to last for years, but why not make some yourself that will last a couple of weeks on the counter or a few months in the freezer. With ingredients found in your pantry and about 10 minutes of your time you can have some healthy dog treats in the oven. Preheat the oven to 350 degrees F. Mix the flour, oats, cranberries and baking powder together in a large bowl. Add the peanut butter, milk, oil and applesauce to the dry ingredients and stir. Press the ingredients together and transfer them from the bowl to a lightly floured counter. Knead the dough until it has come together into a nice ball. If the dough seems too sticky add more flour a tablespoon at a time until the consistency is no longer sticky. Set dough on a sheet of waxed paper and dust the dough and a rolling pin with flour and roll the dough out until it’s about ½ inch thick. 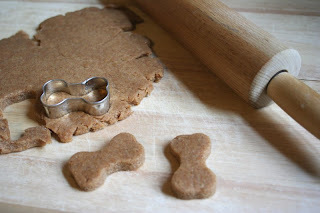 Using a bone shaped cookie cutter cut out the dog biscuits. If you don’t have a bone shaped cookie cutter any other cutter will work. Transfer the cut-out shapes to an unlined baking sheet and bake for 20 minutes or until golden brown. The remaining dough can be rerolled and cut into additional biscuits. When the biscuits have cooled completely store them in an airtight container at room temperature for up to 2 weeks or in the freezer for up to 6 months. Allow biscuits to sit out for 10 to 20 minutes before serving from the freezer. This recipe is adaptable, if your dog has an allergy to white flour substitute for the same amount of rice flour and bake as directed. According to the FDA’s Center for Veterinarian Medicine dogs should not be given real bones to chew on, like those from a ham or roast. Chewing on these bones could cause choking, broken teeth, tongue injuries and many more. Dog biscuits are a safer option. To dress up the dog biscuits for gift giving, dip one end of the dog biscuit into some melted carob (artificial chocolate) and allow the dipped biscuits to cool on a sheet of waxed paper until the carob has hardened completely. Carob is safe for dogs, but you should never give dogs real chocolate because some dogs may have a severe allergic reaction. Fill a cellophane bag with some dipped dog biscuits and tie it with some ribbon. Add the bag of biscuits to a basket filled with a ball, a leash and some other fun dog gifts for a fun gift basket that would be perfect for any dog lover, or give just the bag of biscuits to all of your friends and neighbors who own dogs. Make larger dog biscuits for bigger dogs and mini-sized biscuits for your petite dog friends. If you’ve adopted a dog that was in need of a forever home, CONGRATULATIONS! You’ve done a wonderful thing, and your new family member will bring you joy every day. Adopted dogs come from all kinds of backgrounds, but there’s one common denominator. Most have been in environments where there was limited social interaction. At best, foster homes sometimes provide the opportunity to play with one permanent pet; or your new pet may have occasionally romped in a dog park. However , chances are your dog has been crated or caged a good percentage of the time, for example in a rescue organization’s kennel. At any rate, none of the usual situations allows a pup to meet new play pals and new people under the supervision of skilled dog professionals. In fact, dogs often acquire bad habits when left to play unsupervised, like getting what they want through dominance or aggression. It’s a bit like a school yard: if there are no adults around, some kids turn into bullies. Similarly, dogs with limited social skills tend to jump up when meeting a new person in order to be at the person’s level and to try to monopolize his or her attention. The role of a dog daycare attendant is to interrupt behaviors that aren’t acceptable, just like monitoring adults on a kids’ playground. With dogs, though, the line between excitement and aggression is quite thin. Rambunctious play easily explodes into a fight - it’s just the nature of the beast. In the wild, dogs use play to practice their hunting skills, and there’s some of that predatory instinct left in pet dogs. Trained daycare attendants know when to step in between pups who are overly excited before any aggression shows up. The pups get affectionate praise for toning down the intensity of their play, and are separated (and possibly crated for a couple of minutes) if they insist on being rough with each other. 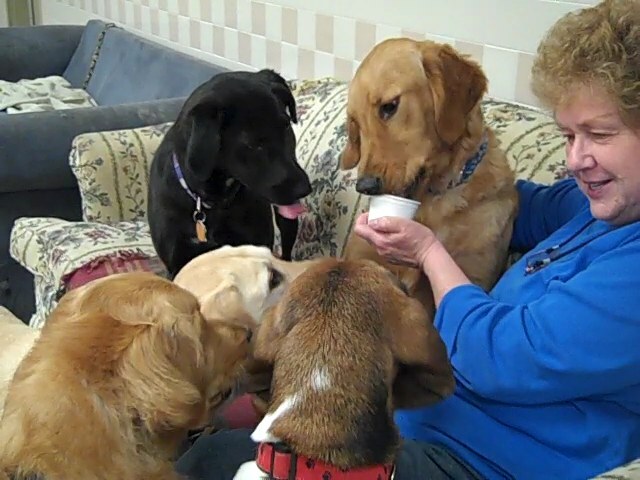 The best environment for your dog to play safely with other dogs and to meet new people is a doggie daycare. Good doggie daycares hire and train their staff with a view to creating just the right environment for maximum fun and minimum risk. There are rules for meeting a new person, like not jumping up on him or her. Dogs learn to say hello by wagging their tail and looking at the new person with a doggie “smile”. Pushing or scaring other dogs away in order to be first in line for attention leads to a “time out” rather than to affectionate attention; as does mounting another dog, excessive barking or trying to monopolize all of the available toys (this is called “resource guarding”). Appropriate play leads to praise and cuddles and games of fetch with a daycare attendant. So taking your pet to a good daycare a couple of times a week has the benefit of improving his social skills, which makes him lots of fun to have around. Because the dog has a life outside your home, he will also acquire self confidence. Pup will feel fine about being away from family for the day; and even better about being picked up at night! And the big plus for owners is that after a hard day at work, you come home to an exhausted pup who just wants to curl up next to you in the evening. Of course, it’s important to check out a daycare before leaving your dog there. Get references from people who are or have been longtime customers. Ask around to see if dog owners have heard of the establishment. Your vet may also be a good source of information about local daycares. Look for one where the employees have lots of dog experience, and the canine guests get to play, without being crated for most of the day. A dog's nails are very important parts of their bodies. Dogs are what we call “digitigrade,” meaning that they walk on their toes. Canine nails are made of the same material as ours and also continuously grow like ours do. When left for too long, overgrown nails can cause pain and difficulty walking. That's why having short nails is so important; can you imagine walking on long, pointy nails? Yikes! You stop and think; what can you do? His nails are too long so you persist, praying you won't hurt him. He "play bites" you, putting his teeth into your hand. Maybe he even begins to bark and growl. The more you try, the wilder he gets. Oh, the drama! Frustrated, you are tempted to give up. You tell yourself that his nails can grow until they become "weapons of mass destruction" for all you care. But then reason wins out. You know that there is no getting around it - those nails MUST be trimmed. I have some good news. Approaching the problem with a different tool can make things much easier. In fact, the traditional nail clippers that people tend to use on their dogs could be a reason why so many pets hide when it's nail trimming time: the blades can pinch and twist the nail, adding more pain to an already uncomfortable process. A nail grinder may be just what you need to take the sting out of clipping. It does not cut the nail. Instead, it files the nail away a little at a time, eliminating the need for painful bladed clippers and making the experience a much more pleasant one. There are many different types of nail grinders on the market. My staff and I have tried them all to find out which one is best. When all was said and done, I really liked the Gentle Paws nail grinder, so I asked one of our veterinarians, Dr. Karin Szust, to take it home and try it on her 5 dogs. Dr. Szust came into the office this morning and told us that she agreed—she really loved this nail grinder. There are lots of great things to say about it (it's easy to handle, powerful, and the results are wonderful) but the most important in my opinion is that the dogs like it. Transitioning to a grinder from clippers can seem difficult at first because many dogs are wary of the noise. But Gentle Paws is quieter than most grinders, and can easily be worked into your dog's routine. Just gradually introduce it to your dog by first letting them investigate it, then leaving the grinder running while you gently pet and reassure them. Karin's dogs warmed up to it very quickly; once the dogs realized that this gadget wasn't going to hurt them, they relaxed and cooperated. Karin loved Gentle Paws and so did her dogs. Now the dogs have smooth, healthy nails and everybody was happy! We give Gentle Paws two thumbs up and you will, too! With Gentle Paws there will be no more struggling and no more painful trimming accidents. It really makes the job quick and easy. And you get smooth, rounded nails in just a few minutes! Jasmine, the timid, abused, deserted waif, became the animal sanctuary's resident surrogate mother, a role for which she might have been born. The list of orphaned and abandoned youngsters she has cared for comprises five fox cubs, four badger cubs, fifteen chicks, eight guinea pigs, two stray puppies and fifteen rabbits - and one roe deer fawn. Tiny Bramble, eleven weeks old, was found semi-conscious in a field. Upon arrival at the sanctuary, Jasmine cuddled up to her to keep her warm, and then went into the full foster-mum role. Jasmine the greyhound showers Bramble the roe deer with affection, and makes sure nothing is matted. "They are inseparable," says Geoff. "Bramble walks between her legs, and they keep kissing each other. They walk together round the sanctuary. It's a real treat to see them." Is your dog driving you crazy with his bad behavior? Almost all dogs I know have at least one habit that drives their owner crazy - typically things like chewing up shoes, shredding books, and getting into the garbage. It's a frustrating situation that a lot of owners just don't know how to handle. Sometimes they even resort to ineffective or even damaging methods of punishment as a way to stop the behavior. Don't pull your hair out or punish the dog! Instead, you can figure out what's causing the destructive behavior and eliminate it. This is easier than it sounds. Behaviors that are considered “bad” are most frequently caused by a small number of issues. Today I'd like to tell you about them, as well as some simple ways to deal with them. If your dog is urinating or defecating inside the house, don't scold him - he may be showing symptoms of a health problem. Excessive scratching and rubbing against furniture can be indicators that your dog has allergies. Persistent gnawing might be an indication of tooth pain or disease. Keep an eye on what your dog is doing, since he might be telling you that something is wrong! The first thing you should do if your dog starts acting out - especially if he's never done it before - is take your dog in to see the vet. Your vet will be able to diagnose or rule out health problems. Of course, your vet might find that there is nothing wrong physically with your dog. In that case, it's possible that your dog is simply bored! Does your dog have something to do when you're not at home? Do you give him plenty of play time and exercise? When a dog is bored, he might find ways of making his own fun. This can lead to destruction of your things, or even your dog getting into places that can be dangerous to him. To prevent boredom, give your dog plenty of interactive toys to keep him busy when you aren't there to play with him. Try to take out your dog for runs or take him to a dog park once in a while to keep him active. Training sessions can also help reduce boredom, since they give your dog something to occupy his mind. Finally, your dog might be acting out because it's the way he expresses stress. Changes in your dog's environment or routine can make him anxious. If your dog starts urinating on ( “marking”) your furniture and home, he might be trying to mark your home as his territory. Think of marking as a billboard that says “This is mine.” A sudden increase in barking and whining can also indicate that your dog is feeling stressed. To help your dog deal with stress, don't just treat the symptoms; you should aim to reduce or remove the stressor. Of course, this isn't always possible - like when you move to a new house or get a new pet. In these cases, you can use Comfort Zone with D.A.P. Comfort Zone works by releasing dog pheromones (all-natural stress reducing compounds) into the air. Your dog smells these pheromones and they comfort him, making him feel secure in his environment - without needing to mark his territory or act out in other ways. Comfort Zone has been shown to reduce fear and stress-related destructive behavior by up to 65% according to studies. Your dog feels safe and secure, and you don't have to deal with his destructive behavior anymore - it's a solution that benefits everyone. You see, if your dog starts displaying negative or “bad” behavior, don't punish him for it! Many times it's a symptom of one of the above causes. Consult with your vet, make sure your dog is getting enough activity and mental stimulation, and use Comfort Zone - and your dog will be back to his normal self in no time!